The Rhode Island School of Design (RISD)’s board of trustees have denied a claim on a painting by Pablo Picasso which the heirs of the prominent art Paris collector Alphonse Kann said was looted in occupied France by the Nazis. The Cubist work, Femme assise au livre (Seated woman with a book) (around 1910-12), was purchased by the university in the US from the Carstairs Gallery in 1951 and has regularly been on public display at the RISD Museum since then. Kann (1870-1948), a prominent Jewish art collector and dealer, was known for his astute collecting sense and varied tastes. A naturalised British citizen, he fled France for London just before the Nazi occupation, leaving most of his art behind. Nazis pillaged his residence at St Germain-en-Laye near Paris in October 1940, taking the entire collection there. After the war, most of the 1,202 Nazi-inventoried works were returned to him, but Kann himself never kept a precise record of his collection. Kann’s heirs started tracking down other works from his collection in the 1990s, and first made a claim to the Picasso painting at RISD in 2010. The university then commissioned the Nazi-era provenance expert Laurie Stein to investigate the work’s history and “follow the facts wherever they led”. Based on Stein’s report, the museum rejected the claim in 2012. The heirs reasserted their case through the US Attorney’s Office for the Southern District of New York in 2015, after the Paris-based Kann Association requested its involvement. RISD then commissioned Stein and additional experts in the US and France to research any newly available information, the university says. Stein’s final findings were that that the Picasso, while once owned by Kann, was not looted from his collection. “The claim is not supported by the extremely extensive evidence”, says Roseanne Somerson, the president of RISD. Thousands of documents and archives in several countries were examined and RISD has shared the research findings and source documents with the heirs, according to a statement. The report concludes that “Kann either sold or exchanged” the painting that is now at RISD “as he was active in the art market and was engaged in selling works by Picasso to dealers”. The report notes that “Kann’s collection was never static” and that, according to Picasso biographer John Richardson, Kann “played the art market like the stock market”. A photograph in French government archives shows the RISD painting on the wall of his St Germain-en-Laye home around 1926. But Kann moved art from residence to residence, the provenance report says. In the post-war restitution efforts, neither Kann nor his representatives, despite having the photo “in front of them” during the recovery efforts, identified the RISD painting as one of the items stolen in 1940, the museum adds. While the research has so far found no documentation that shows how the Picasso painting came to the US, the Carstairs Gallery had a history of dealing with Kann and his estate on other works of art. Similar sales of Picasso’s work at the time of the university’s acquisition show that the $1,600 it paid was a fair market price, the report adds. The RISD Museum also owns an earlier painting by Picasso, The Diners (Les Soupeurs) (1901), that it acquired in 1957 through the bequest of George Pierce Metcalf, the Providence Journal publisher and businessman. Both the US Attorney’s Office for the Southern District of New York and the association of Kann Heirs in France, En Memoire d’Alphonse Kann, declined to comment for this story. 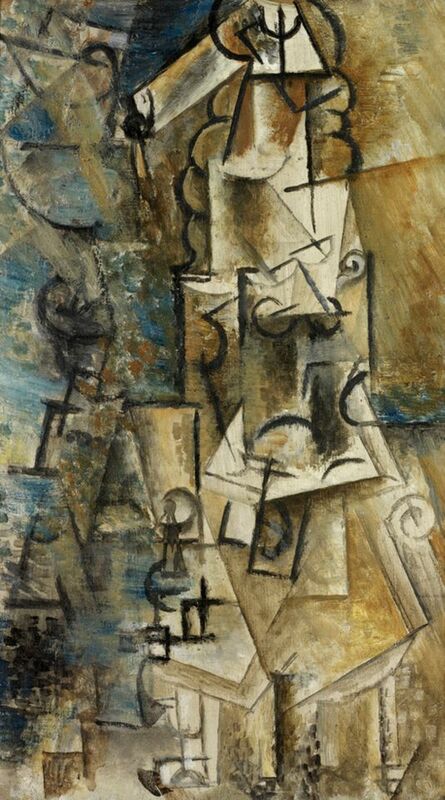 The heirs have made various art restitution claims in the past, some of which have succeeded, including the 2008 recovery of a Léger painting from the Minneapolis Institute of Arts and a 2006 settlement with the French government that allowed Georges Braque’s Man with a guitar (1914) to remain on display at the Centre Pompidou. Other claims, including for a group of manuscripts owned by the Wildenstein family, have been denied.